Jerry Oltion (pronounced OL-tee-un) has been a gardener, stone mason, carpenter, oilfield worker, forester, land surveyor, rock 'n' roll deejay, printer, proofreader, editor, publisher, computer consultant, movie extra, corporate secretary, magazine columnist, and garbage truck driver. For the last 37 years he has also been a writer, with 15 novels and over 150 stories published so far. Click here for a bibliography list. Jerry has recently become a regular columnist for Sky & Telescope magazine, writing a column called "Astronomer's Workbench" featuring homemade astronomy equipment of all types, from simple accessories to complete telescopes. His column is a continuation of Gary Seronik's "Telescope Workshop" now that Gary has moved on to edit SkyNews. Jerry has begun putting his stories online in Kindle format at Amazon.com. It's a slow process, but he's working on it. He's starting from the beginning and working forward, so you can follow the development of his style and his career as he gets them formatted and posted. (He's still pretty happy with them all, even the very first ones.) Check for new entries Here. 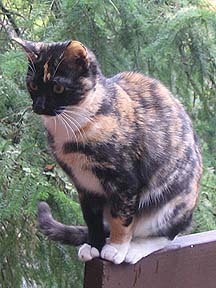 Jerry and his wife, Kathy, live in Eugene, Oregon, with their cat, Stormy. They both write science fiction, and Kathy also works in a medical laboratory. Their hobbies include electric guitar, electric bass, gardening, and astronomy. Oh, man, have they gotten into astronomy. Click here to look at some of their telescopes and astrophotos. Jerry spent most of 2005 designing and building a new type of telescope called the Trackball. It was featured in the August, 2006 issue of Sky & Telescope magazine. Click the link above or click on the trackball in the photo to learn how it works and how to make one for yourself. After years of testing the hardness of his pitch laps with a thumbnail, Jerry finally got serious and made a pitch hardness tester that will give him some numbers he can compare to others. It's based on the design in appendix J of Jean Texerau's classic How to Make a Telescope, Second Edition. Click here for more details. The December 2016 Astronomer's Workbench column in Sky & Telescope magazine is about this observing chair. Click here for more details on the chair's design. In 2015 Jerry built a tracking mechanism he calls a "Flex Equatorial Platform." It's designed for the big binocular scope below, and for the big 20" dob. It lets these scopes track the sky so you don't have to push them along by hand. It's a variation on the Poncet Platform, using the minimalist design of a flex rocker to reduce its size and weight to the bare minimum. It only adds 4" to the height of the telescope, yet provides nearly an hour of tracking time without resetting. Sky & Telescope magazine ran an article about it in their April, 2016 issue. Read more about it here. Jerry spent the winter of 2013-2014 building a huge binocular telescope. It's by far the most ambitious telescope-building project Jerry has done to date, and it's one of the neatest telescopes to use. The view through it is simply stunning. With both eyes involved, you see so much more than with a single scope. Sky & Telescope magazine ran an article about it in their January, 2015 issue. Check out more information about it here. 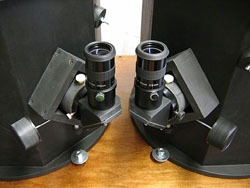 The editor of Sky & Telescope's "Telescope Workshop" column was so impressed by Jerry's focuser design for the above binocular scope that he ran a separate article on that in the February, 2015 issue. Check that out here. Kathy went through quite a time with cataracts over the last few years. They severely affected her ability to enjoy amateur astronomy, and the surgery to replace the cloudy lenses caused complications that made some aspects of her vision even worse. The story has a happy ending, but we learned enough along the way that we decided to share her experience in the hope that it might ward off the same problems for other people. Click here or on the photo to the left to read our article about Cataracts and the Amateur Astronomer. Here's Jerry's latest trackball creation, a 12.5-inch scope with an ultra-light secondary cage. The whole top end only weighs 2.5 pounds. The scope was featured in the May 2014 issue of Sky & Telescope magazine. Click the photo or click here for more information on the design of this scope. Jerry has learned to make finders as well as telescopes. His favorite design is the "Split-Pupil" finder shown here. Sky & Telescope magazine featured this finder in their June 2013 issue. Click the photo or click here for a page describing this finder and how to build one. Winter is telescope building season in Oregon, and the winter of 2010-2011 was an especially long one, so Jerry made an especially cool telescope: a double-scale copy of the Edmund Scientific Astroscan. The Astroscan is one of the world's most popular telescopes, for good reason: it's incredibly easy to use and it has good optics. Jerry's scaled-up version expands on that in one important way besides simply increasing its size: the Big Astroscan also tracks, using the trackball concept mentioned above. The Big Astroscan was featured in the September, 2011 issue of Sky & Telescope magazine. Click the photo or the link above to go to a page describing how Jerry built it. Jerry also built a star-testing telescope that was featured in the April, 2009 issue of Sky & Telescope magazine. Click on the photo at left to go to a page describing that scope. Kathy and Jerry still drive a 1969 Volkswagen beetle that Kathy has owned since 1975 (longer than she's had Jerry). Alas, in September of 2006, someone ran into the back of it. The impact pushed it into the car in front of it, so all four fenders, trunk, and hood were damaged, along with the bumpers and even some of the engine parts. The insurance company totalled it, but Jerry & Kathy bought it back and rebuilt it. Kathy is once again driving it to work, and watching out for distracted drivers. In 2005 Jerry & Kathy got a kitten they named Stormy because of the lightning bolt on her forehead and because she seemed like a force of nature when she tore around through the house. It's hard to believe she's already a middle-aged cat, but she can still be as rambunctious as ever when she wants to. Paradise Passed is Jerry's favorite novel, the one he has spent the last two decades writing. He poured his heart and soul into it, blending bizarre aliens, wacky religion, good intentions, and bad luck into a coming of age story that will leave you thinking about it long after you're done reading. It's got Jerry's patented sense of humor, but this time that humor comes with an undercurrent of social tension that will keep you on the edge of your chair until the very last page. And if that's not enough enticement, it has a gorgeous cover by Hugo-winning artist Frank Wu. It's in trade paperback and can be purchased directly from the publisher, Wheatland Press. Anywhere But Here is a sequel to The Getaway Special, but it's really about the world we live in today. The dust jacket says it best: "In a world dominated by America's heavy hand, an independent scientist reveals the secret of fast, cheap interstellar travel, sparking an exodus like none in history. When anyone with a few hundred dollars and a little ingenuity can build his own spaceship, even American citizens can't wait to get out from under the United States' domineering thumb. Trent and Donna Stinson, of Rock Springs, Wyoming, seal up their pickup for vacuum and go looking for a better life among the stars, but they soon learn that you can't outrun your problems. America's belligerent foreign policy is expanding just as fast as the world's refugees, threatening to destroy humanity's last chance for peaceful coexistence. When their own government tries to kill them for exercising the freedoms that people once took for granted, Trent and Donna reluctantly admit that America must be stopped. But how can patriotic citizens fight their own country? And how can they succeed where the rest of the world has failed?" Anywhere But Here won the Endeavor Award for best novel written by a Northwest Author. The Getaway Special is pure escapist fiction. It's about a card-carrying mad scientist (a member of the International Network of Scientists Against Nuclear Extermination, or INSANE for short) who invents a hyperdrive engine that will take people anywhere in the universe they want to go, with parts they can buy at Radio Shack. Anything that will hold air can become a spaceship, but people soon learn that space travel is not for the faint of heart. And if the aliens have their way, it might not be for anyone! Jerry's latest collection of short stories, Twenty Questions, contains 20 of his previously published stories, some from obscure magazines and anthologies that you probably didn't see the first time around. There's a general introduction by the author, as well as individual notes about each story. Plus there's an added bonus: a scholarly article that finally answers once and for all the question, "What's the difference between science fiction and fantasy?" The book is in trade paperback form and can be purchased directly from the publisher, Wheatland Press. Jerry's novella, "Abandon in Place", won the Nebula Award for best novella of 1997. It's about the ghost of the Apollo space program, and the astronauts who learn how to harness it. The story is available in the Nebula Awards 1997 anthology, edited by Connie Willis. People kept asking what happened to the main characters after they got back to Earth, so Jerry wrote a novel about them and Tor published it under the same title: Abandon in Place. Jerry wanted to call it If Wishes Were Rockets, but he was overruled. The novel contains the novella in its opening section, so you don't need to track that down if you want to read the novel. One of Jerry's short stories, "In the Autumn of the Empire" is now available in the Diamonds in the Sky anthology, an online anthology of astronomy-themed science fiction stories. The anthology concept is very cool: it's a collection of stories that illustrate basic astronomical concepts in an entertaining way, so readers can learn something about astronomy while enjoying some fun stories in the process. "In the Autumn of the Empire" deals with the seasons, and with some of the misconceptions people have about them. The anthology is free, so go have a look. (Click on the link above, or the cover art to the left). "In the Autumn of the Empire" is also reprinted in the October, 2009 Analog magazine. Another of Jerry's novellas, "Judgment Passed," was published in the Wastelands anthology edited by John Joseph Adams. "Judgment Passed" is an exploration of what it might be like to be not just left behind after the biblical rapture, but left alone. To an agnostic or an atheist, that could be a dream come true. You can find the print version just about anywhere books are sold, and an electronic version here. 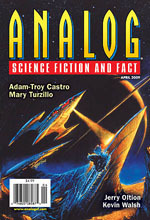 Another of Jerry's stories, "The Astronaut from Wyoming," co-written with Adam-Troy Castro and published in the July/August 1999 issue of Analog magazine, was nominated for both the Nebula and the Hugo award. In 2007 the story won the Seiun award for best translated work in Japanese. 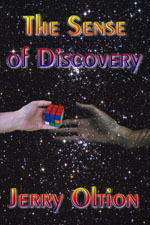 The story is available online at Fictionwise.com and in the collection With Stars in Their Eyes from Wildside Press. Jerry's other novels include two books in the "Isaac Asimov's Robot City/Robots and Aliens" series (Alliance and Humanity), and four Star Trek books, Twilight's End, Mudd In Your Eye, Where Sea Meets Sky, and a collaboration with Kathy called The Flaming Arrow. Jerry also writes under the name "Ryan Hughes." The Hughes books include media tie-ins in the Dark Sun, Shadow Warrior, and Unreal universes. See the bibliography for titles. Several of Jerry's books (including one of the Robot City books and all of the Star Trek books) can be purchased in electronic format from BooksonBoard. A two-volume collection of Jerry's early short stories are available in signed, limited-edition hardcover. If you're interested, email Jerry for more information at the address below.